they were created, and how the AI is set up to function. So come check it out! In Legends of the Brawl, enemy AI is set up to complement our co-op/pvp multiplayer. Sets of enemies and different objectives are spawned into the levels, so a variety of enemies and attack types were created to mix things up. Co-op play is encouraged for puzzle solving and combat, especially when mobs are spawned in while objectives are open. Fighting some of these enemies by yourself is not wise. So, over the next couple of weeks we're going to talk about a few of the enemies from the Castle Graveyard environment to give you a better idea of what you will be fighting and how the dynamics fit. First up, the wolves! 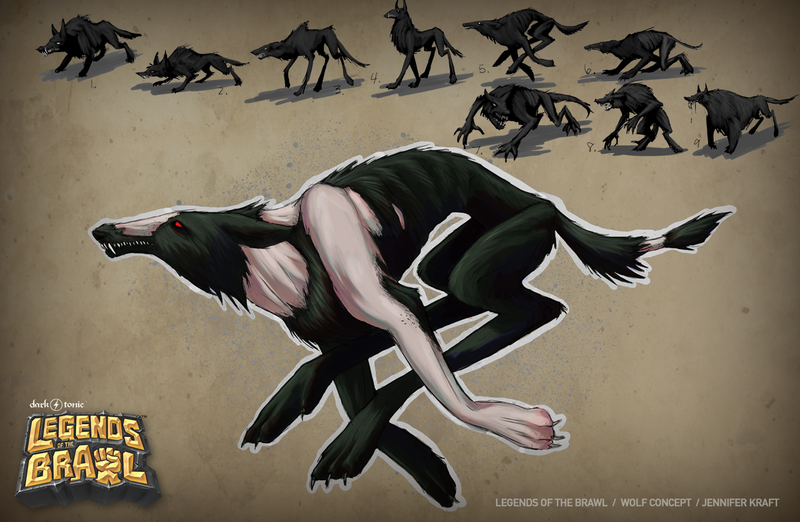 Wolf behavior has been designed around melee combat, as well as player movement speeds. The wolf is always on offense and trying to get inside your melee range. They will chase you relentlessly (rather panic inducing! ), and when close enough, do a jumping lunge attack. This will get you either running or defending. If you stop to fight or block, the wolf will do a standing bite combo, and keep you busy while its friends show up to chew your behind. Not a high damage dealer, but watch out when surrounded by a group of them! For now, the wolves' target detection is based on distance and they detect in 360 degrees. Some of this behavior and detection will be changed when ranged combat is more functional and players can kite enemies. Alpha Wolves are bigger, deal more damage, and are slightly tankier. They have the ability to howl & spawn a fresh group of wolves, so you'll want to take these guys out as soon as you can. You can identify them by their darker coat and glowing eyes. We’ve been using an awesome Unity plugin called Behavior Designer, developed by Opsive, to piece together our game’s NPC AI for a "vertical slice" (essentially a fully realized portion of the game, like a demo) and wanted to show a little about our process for that, which might help out some other indie devs. The notated descriptions should be fairly self explanatory, and the flow was created to satisfy our desired gameplay design for these guys, which we covered above. Next week we'll be talking about our Dark Bride vampires and covering a bit about how the AI works together. Stay tuned, and follow us on Facebook and Twitter for all the updates!